While most of the Mahavidyas are beautiful and alluring, Dhumavati is the only one who is not good looking. She is widowed and is set in a cemetery. She is covered with smoke too. There are many legends and stories that are attributed to her. One popular legend revolves around Goddess Sati’s hunger pangs. She was so hungry that she asked Lord Shiva to get her something to eat. But he refused, as he is not a householder. She had to repeat the request but it went unheeded. She was so famished that she devoured Him! Once she had swallowed her husband, He was upset. He requested her to let him out. She did with lot of hesitancy. Shiva had no other option but to curse her. He said she would become a widow and undergo all the things that a widow goes through! When Sati heard of this there was a lot of smoke emitting out from all over her body. Her entire beauty was now enveloped with the smoke. She became ugly and looked like a widow indeed. She would now be called Dhuma (smoke) or Dhumvati. The Goddess separated from her husband and lived in solitary existence. She prefers the crow and her new abode became the cremation grounds. She is 7th in line in the list of powerful Mahavidyas. This also promotes another form of tantra connected to the Divine mother goddess. Dhumavati embodies all the latent energies that we all have. Her negative energies are very strong and pervade the universe. She is the smoky form of the powerful Shakti. She is also refered as the eternal widow. Because she is without her consort it means she has other imbalances in her life. She depicts sorrow, dissentient, disenchantment defeat, humiliation and loneliness in life. We all go through such periods of turmoil in our lives. She imparts wisdom from her knowledge bank. 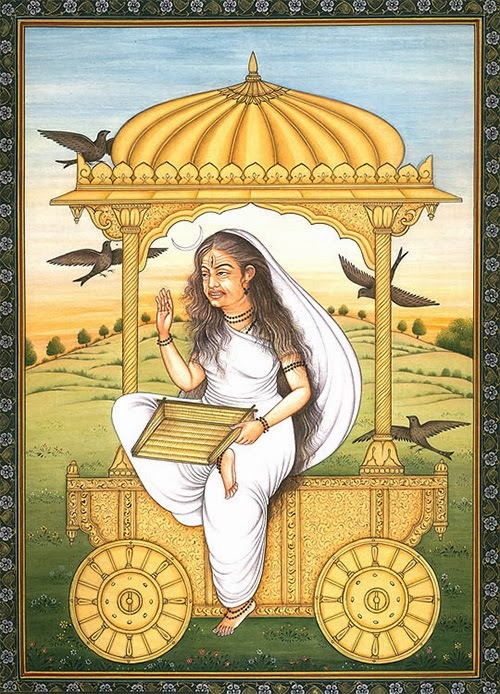 When the earth was under pressure of water the Divine mother manifested as Dhumavati. When she left she was called Alakshmi- ie without any light or radiance. She is an old woman who is sad, angry and also unsteady. Her teeth are bad and breasts are limp. There is no heavenly energy surrounding her. She has a basket in one hand and wears dirty clothes. She also is shown carrying fire pot. Her nose is shaped like that of a crow beak. She is dark and looks cruel. She also has greying hair, torch in hand and a broom. She has tamasic tastes. She looks always hungry and thirsty. Her negative energies provoke sadness, fights, divorces, conflicts and never ending quarrels. She enjoys liquor and also flesh. She is always in a depressed state. Looking at her one wishes to be detached. She is capable of destruction. Since she moves on despite her husband, she shows that if a woman chooses she can remain independent. She is old and ugly and also sad if a woman is without her spouse. She is everything inauspicious in life. Her characteristics are like Nirriti and Jyestha that find a mention in the Rigveda. Both of which were also known in the ancient world to bring misfortune. They were also associated with disease, decay, sickness, poverty and ailments of life. Nirriti is all for disorder and disharmony, decay and eventual demise. She does not like anything that is propitious. Both, Nirriti and Jyestha live in homes where there is quarrel between husband and wife. But Dhumvati can be separated from these because she is a widow, aging and looks ill. But she has some positive aspects like she is able to guide people on the path of spirituality unlike the other two. She also manages to save devotees for troubles. The Dhumvati tantra has a description of the Mahavidya. She is an aging widow. She has no jewels around her neck. Her appearance is shabby and beggar like. She looks fearful due to her bad appearance. But she has a cimudra that means she is willing to give knowledge. She is always hungry and thirsty. If one were to look at her, she invokes all the negativity. But this is the very reason why she gives deep sense of being attached. She holds the fire pot where everything becomes ashen. The sorting basket shows that one should be able to separate the grain form the chaff. She enjoys her poverty and bad lot in society. How many of us go beyond the ambitions and embrace the simple and austere. She seems to suggest that even this aspect of the Mahavidya is a part of life and it should be embraced. There is a scripture called the Prapancasarasa-Samgraha. The Mahavidya’s description is given. She is dark and she wears snakes around her neck. She wears rags taken from the cremation grounds. She has a spear or sword and one skullcap in one arm. Her nose and throat look like that of a crow. She is wrinkled with age and her appearance is very smoky. It is really strange why at all anyone would wish to pray and worship the negativities of the Mahvidya. But she offers true knowledge on spirituality. She is willing to help one to discern between the good and bad. She can also give magical powers. Her followers are mostly tantrics, spinsters and bachelors. Even some widows worship her. But it is not unknown for householders also to seek her blessings. She represents the last stage of the life of a woman. And every beautiful woman should accept it. She is now free of all obligations to society and live a life of peace and focused on the Divine. She shows that the youth is not everlasting. There should be no pride in being lovely and having a good appearance. This is also another facet of life that cannot be ignored or hidden. It needs to be exposed.